An Irish pub. Too many bad Baileys experiences at Bridie O'Reilly's might make you run a mile, but The Last Jar ain't no marketing gimmick. She's the real deal, and you should make a special trip to check this one out. 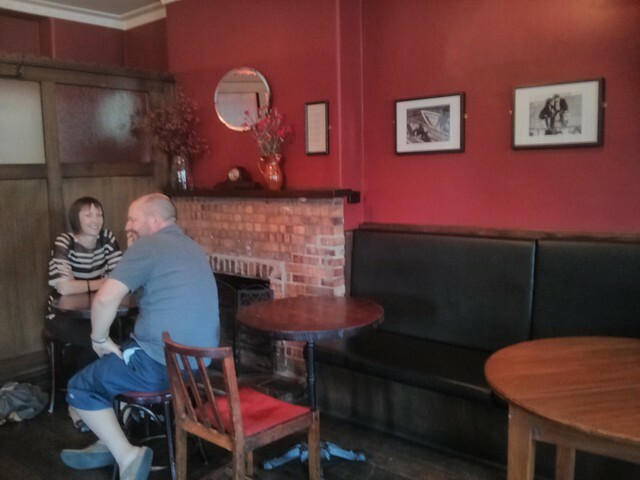 This pub was the old Arthouse and is smack-bang on a busy corner. The cars outside clatter over the tram tracks, but step inside and the noise fades away. My maiden name is Reed, and my collection of 50+ sunscreen bottles shows that despite many generations living in Australia, the Emerald Isle still courses in me veins. It started to bubble the minute I stepped inside. This is the kind of place you could pull up a pew and proceed to get very merry over the course of an afternoon. It's charming and not at all kitsch. The staff we spoke to all had that beautiful Irish lilt that makes even "would you like to see the menu?" sound like a folk song. And what a song. 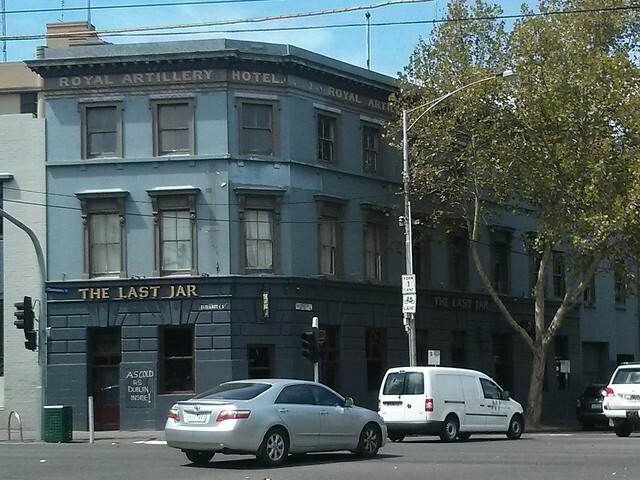 The Last Jar seem to be on a mission to make everything they can in house. House-baked bread, house-cured salmon - even house-made curry sauce, which from Dublin to Derry is the de rigeur dip for your chip. 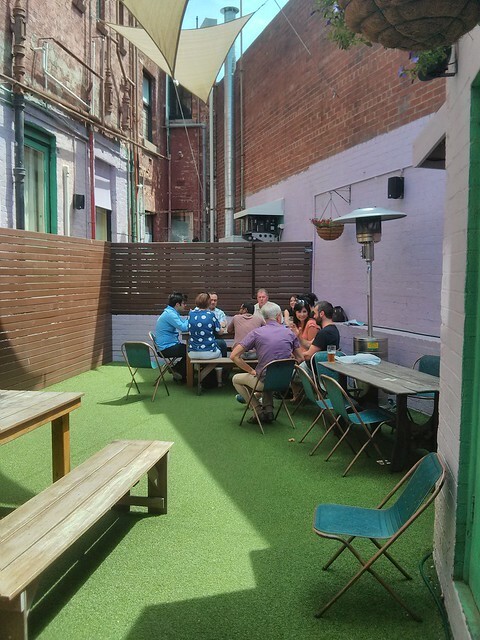 There's a beer garden upstairs which won't break any hearts but if you want a bit of sunshine, it does the job. Do you have a "Do not pass go, do not collect $200" dish that as soon as you see, you just must order? 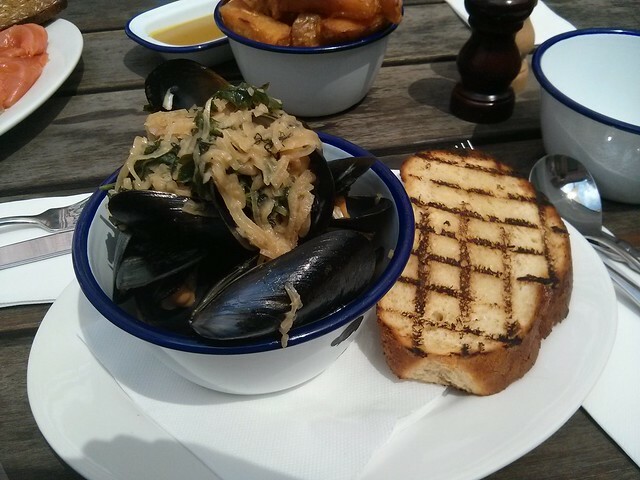 One of my many is mussels. I love the rigamarole of foisting each meaty morsel out of the shells, dunking the bread in the juices, and slurping the last bits of goodness out of each shell - and off the shell itself! These were cooked with cider, dill and loads of sweet onion and served with crisp house-baked potato bread. 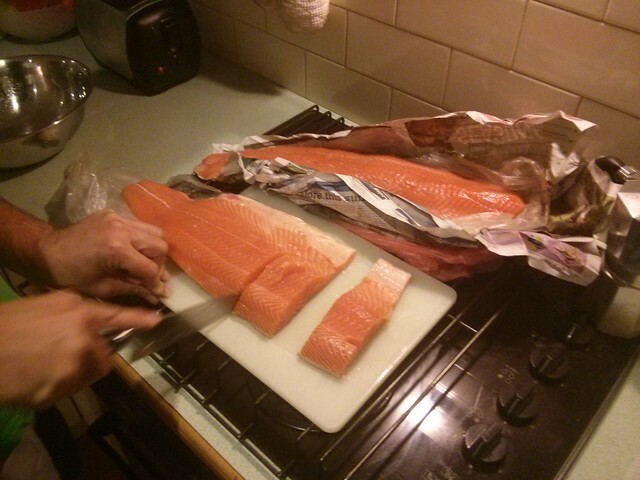 This heaping portion of house-cured salmon clocked in at a mere $12. 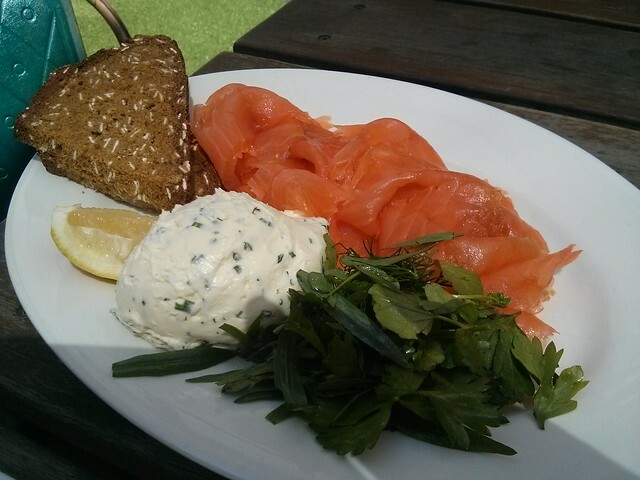 Take a slice of soda bread, apply cream cheese in portions that defy gravity, and drape liberally with smoked salmon. Fabulous. These beauties had that crystalline crunch that can only come from being carefully twice or even thrice cooked. 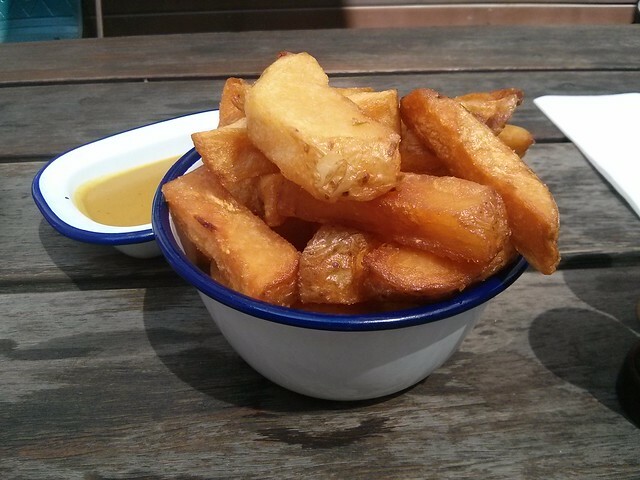 The "curry sauce" is very Irish - a gravy-like dipping sauce lightly seasoned with curry powder. I'm probably too deep in the dead 'orse camp to fully appreciate it, but if you want a real taste of Ireland, order some up! On leaving we spied a blackboard advertising a full Irish breakfast, featuring black pudding, sausage, toast and more, all made in house (says the website, "Everything except the egg"). "How much?" we asked. "Twenty dollars," said the barmaid, "but you can get a pint of Guinness for six dollars with it". Beer. With breakfast. God, I love the Irish. 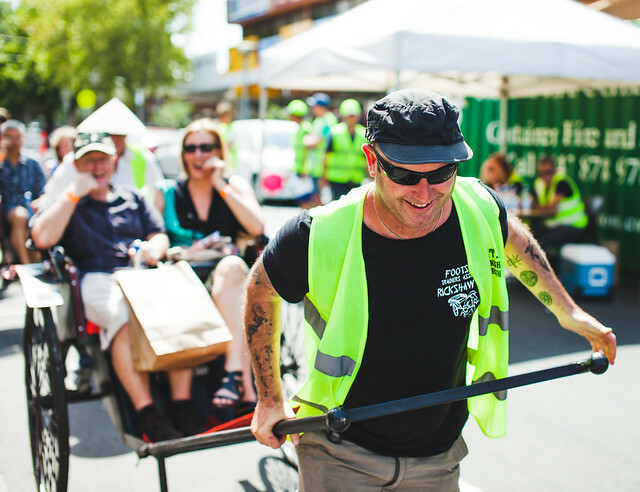 PS: More Rickshaw Run volunteers still needed! Read more about the Rickshaw Run here, and about volunteering here and here. 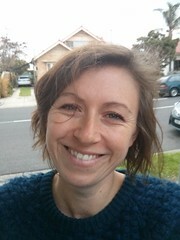 Give me a call on 0438 583 808 to discuss how you can get involved. And if I have somehow failed to return your call, text or email - I've had a lot, bless you all! - PLEASE feel free to call me back and remind me! A critical part of delivering this event is people power. 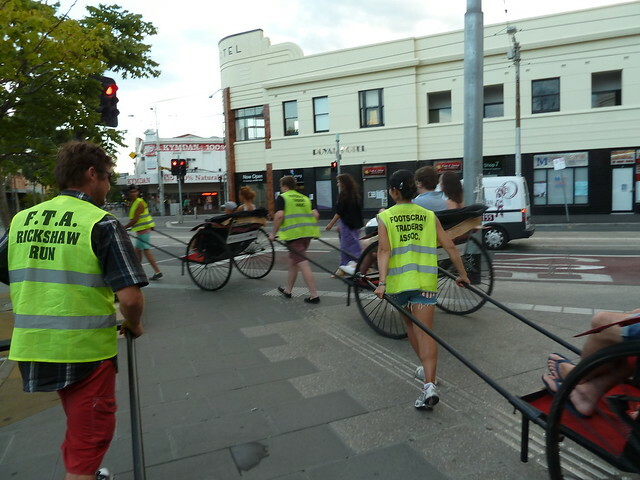 The Rickshaw Run was created by the Footscray Traders Association, for the traders of Footscray. It's a true grass-roots event, and volunteers are a crucial part of making it happen. I volunteered three times last year. I always knew I'd have a good time - but I honestly had a great one. One of my jobs was serving folks at the oyster stand at the start of the run. When I told one group that we were all vollies, she was quite stunned and said, "People just wouldn't do that where I live". In the west - WE DO. * Take a seat in our cosy marquee and check folks in. * Be a "Director of First Impressions" - host folks at their first stop for freshly-shucked oysters, and chat to them about what makes the west great. 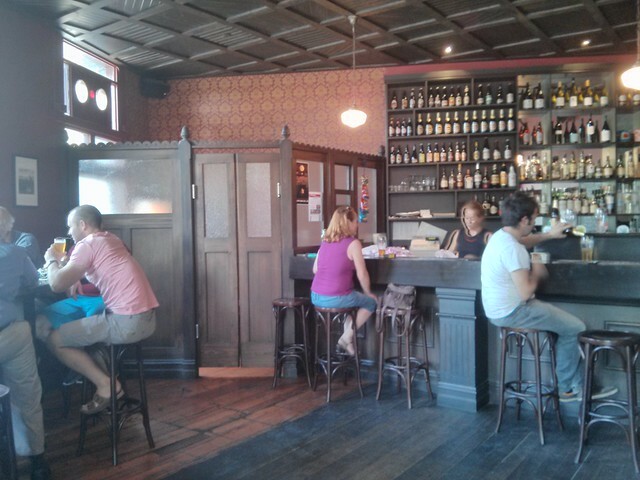 * Welcome patrons to each restaurant, and check on their progress. If they're eating too slowly, offering to eat the rest of their coconut pancake is not encouraged, however. * At stations around the course, jobs such as warning pedestrians of approach of rickshaws, or supervising our live music area. * Think you've got pulling power? 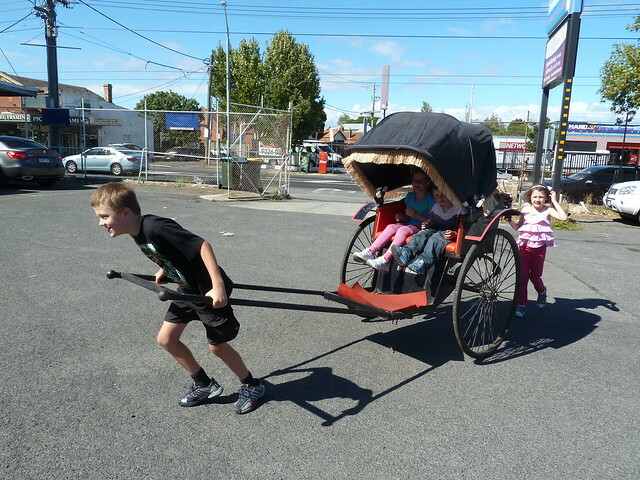 Test your mettle by pulling a rickshaw. It is not as hard as it seems - if the dynamic yet tiny Eve below can do it, you can too! Every volunteer gets a meal after their shift, which is a fun and fantastic way to debrief and meet more fabulous westie folks. You also get an official Rickshaw Run 2014 T-shirt. 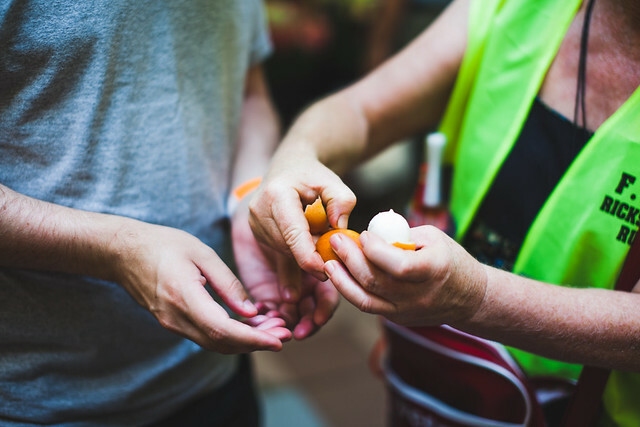 By volunteering, you'll meet your fellow locals, build relationships with traders, develop skills in event management, and get a pass to skip the gym that weekend. Plus, I will also be your best friend forever. We're gonna put the 'scray on show - come and be a part of it! You can definitely do more than one shift, and this would be very welcome. Please call me on 0438 583 808 to talk about how and when you would like to help. Even if you can't help but think you can spread this message - whether via your school, community group, workplace or other network - please call me. 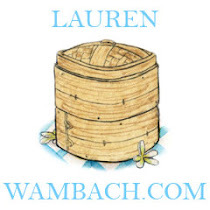 You can also email me on lauren@laurenwambach.com. 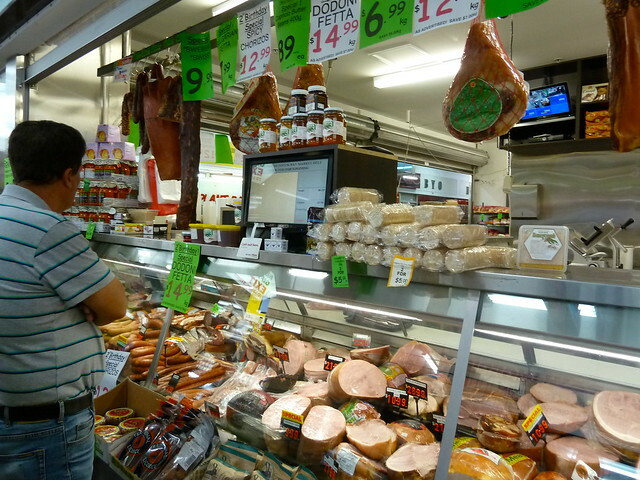 Saying you have found great value in Footscray is kind of like saying you've found a tall tree in the Amazon. But when it comes to dollars and cents, this is one meal that is going to be hard to beat. HM Quan has a menu of 15 different congees - thick rice porridge that is a popular food across Asia, from the Philippines to Vietnam. And - get this - every one is $2.99. 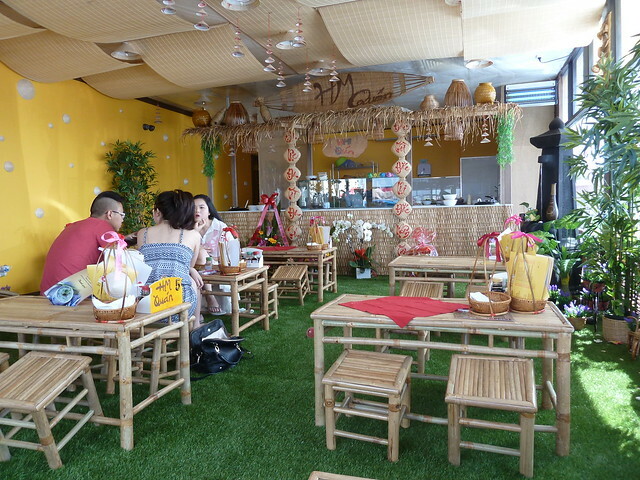 But to be honest, the first thing you will notice is not the price - it is the amazingly fabulous fake grass floor! 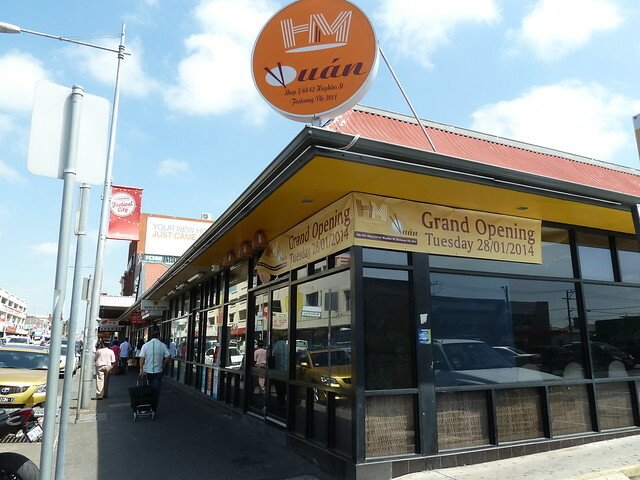 HM Quan is essentially the gateway to Footscray, being right at the very edge of "downtown" as you approach from the east (in the space formerly occupied by Indi Hots). I cannot think of a more delightfully zany welcome mat. So the idea is, you sit down, tick your little menu with a texta and hand it in. There aren't any right or wrong answers on this quiz, though. 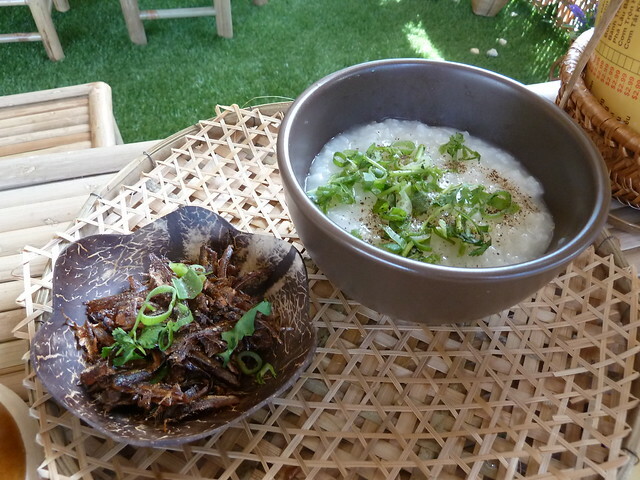 I went for congee with "fish floss", which turned out to be tiny, crisp anchovies. 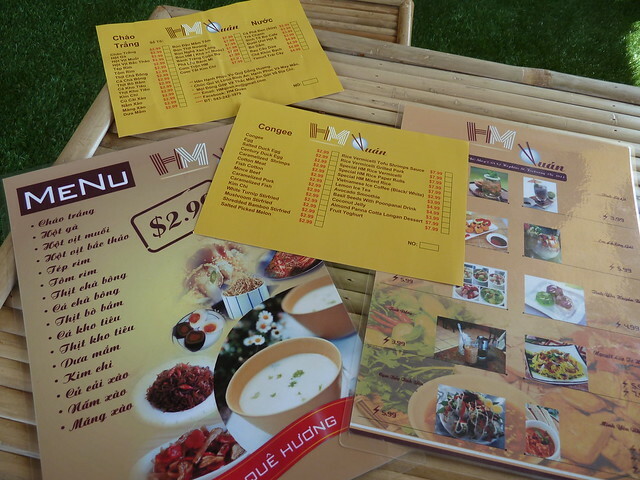 HM's special bun (rice vermicelli) was very interesting and really good. "Normal" Vietnamese bun has rice vermicelli with julienned cucumber, shredded lettuce, pickled carrots and (if you're lucky) some little buttons of crisp pork fat. (Yes, that is what those little crunchy squares are - I didn't know for years and ate them with gusto, and now I do know - and I'm sorry to say, still eat with gusto.) 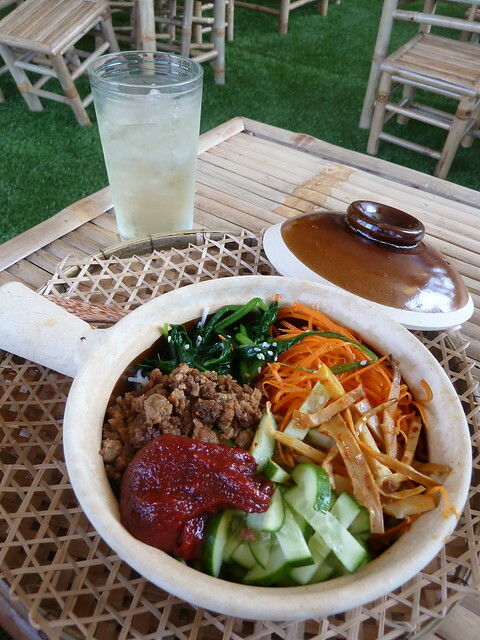 This was almost like a Korean-Vietnamese hybrid, with delicately cooked bamboo and spinach, plus a big dollop of what I think was gochujang (Korean chilli sauce). Not what I was expecting but really good! And - $7.99! Oh and PS - do not try to eat both congee and another meal, like I did above. You will not be able to - the congee looks small but it is really filling. I only found the Vietnamese version of the menu after I ordered when I realised I'd missed my new current obsession - banh trang. They are translated on the English side as "rice paper rolls" which I can usually take or leave, but banh trang are skinnier versions with a curiously crunchy wrapper, and more intense fillings like beef jerky and green papaya. (The above is my fave from Co Thu Quan in Little Saigon.) 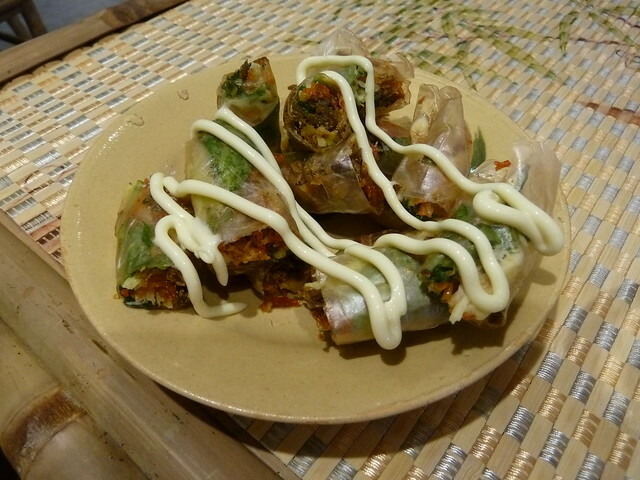 Banh trang are definitely on the menu the next trip I take to HM Quan! HM Quan is quite similar to Co Thu Quan (yet definitely different enough to not be a carbon copy). When Kenny and I were at Co Thu Quan, we had a chat to David, the security manager at Little Saigon. 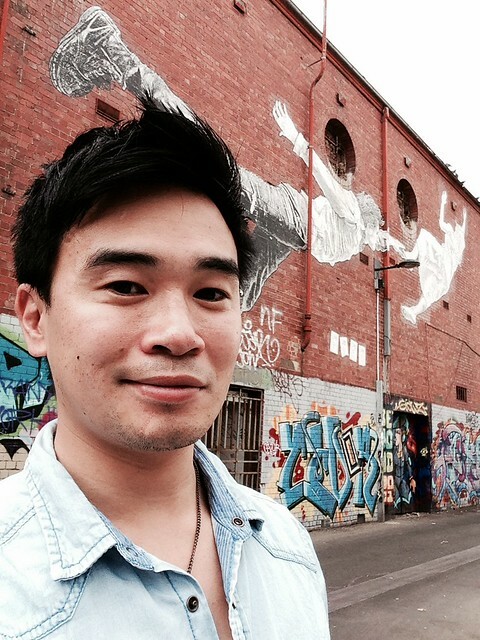 In his opinion, CTQ was appealing to a younger Vietnamese-Australian generation who didn't want to just hunch over soup, but wanted a more fun - yet still authentic - experience. HM Quan to me continues in this vein. 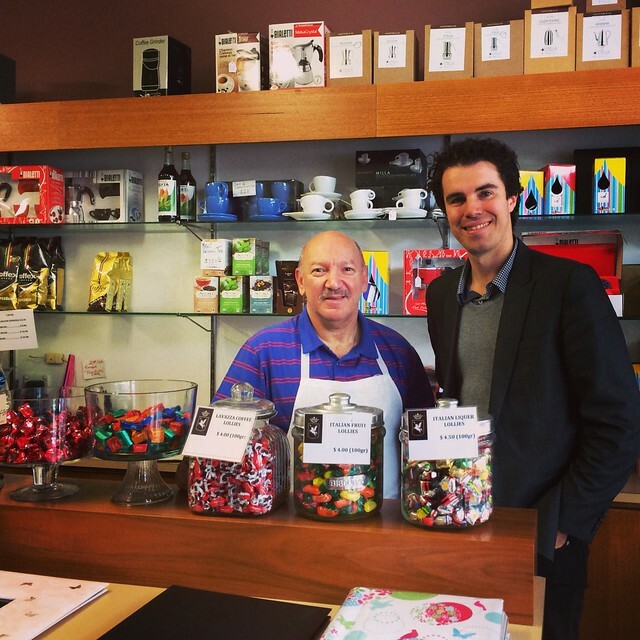 If this is the evolution of Footscray - and not chain stores like Gloria Jean's or Macca's - BRING IT ON. 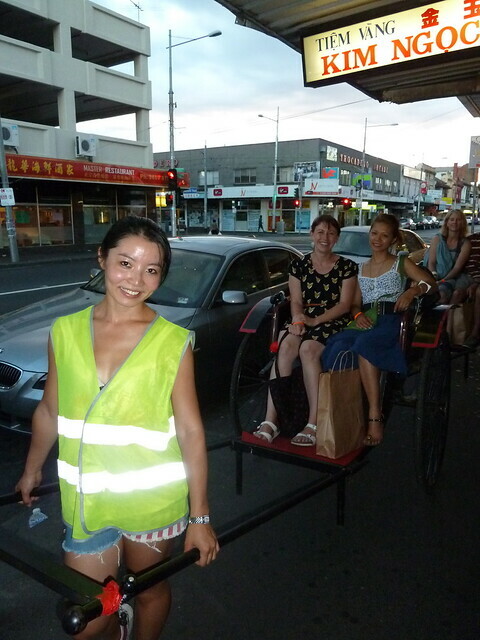 The Footscray Streetwise snacks tour was great fun. 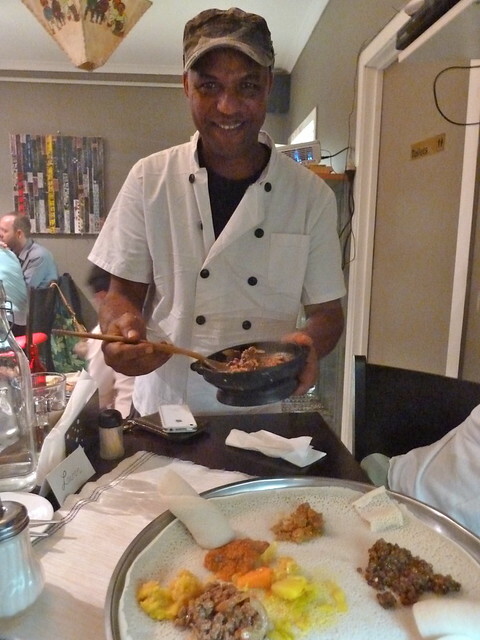 We tried dishes from all over the globe; Somalia, Vietnam, Macedonia and Turkey! 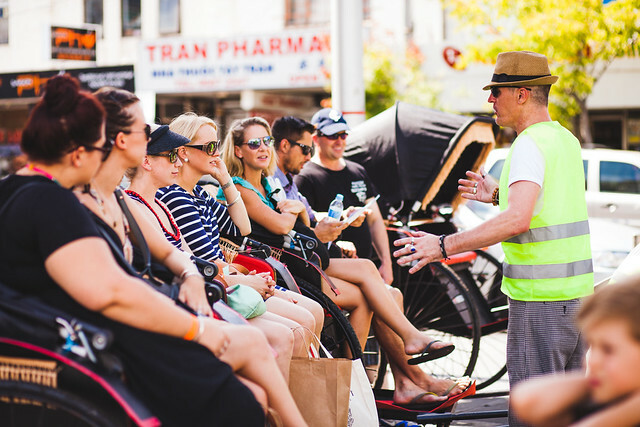 The tour is such a great way to explore the many hidden treasures of Footscray. Lauren took us to all the best spots and gave us plenty of tips on what to keep an eye out for. 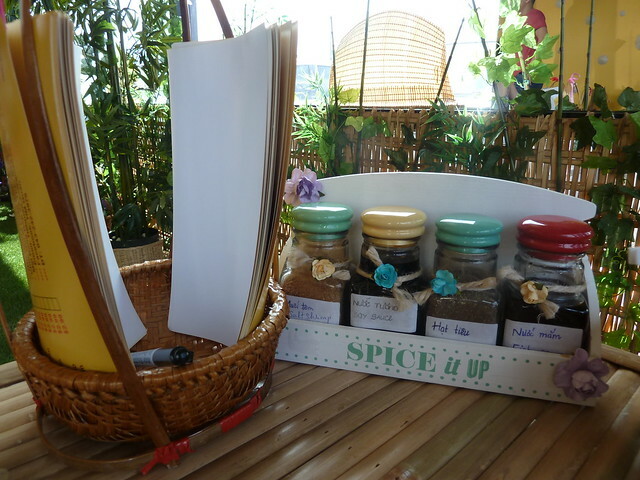 She could even tell us the ingredients of each dish and explain how they were cooked. A must for any worldly foodie (and those of us wannabes). You certainly won't be left hungry! So much food! 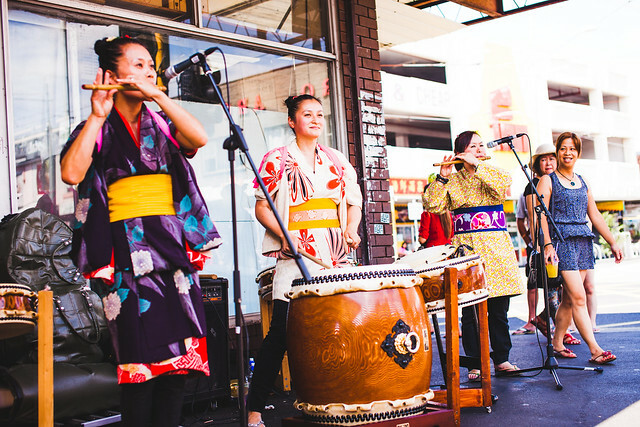 This Wednesday at 11am, come on a Fresh Food Ramble with me and discover the electric, eclectic tastes of multicultural Footscray through its two amazing fresh food markets and surrounds. 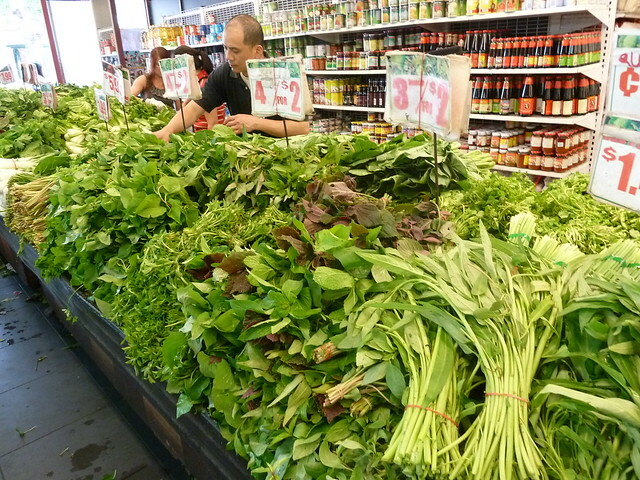 Discover everything from "fish mint" to sugarcane juice to just-shucked oysters. Do you find the markets a touch intimidating? Or do you want to know where the go-to spots are? 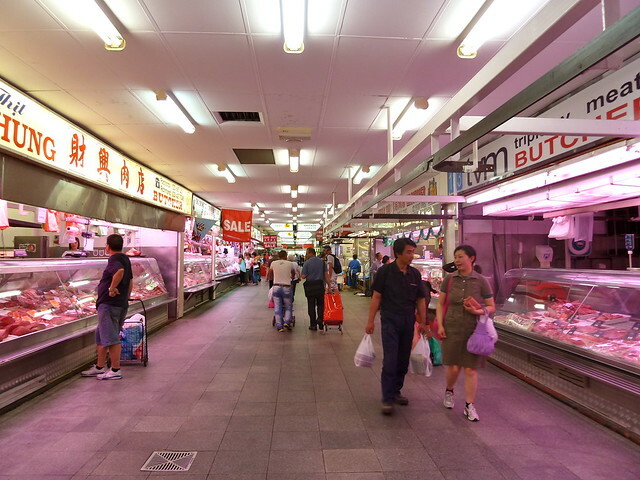 Meet the traders and get my insider tips on where to shop and what to buy - like where to get this ridiculously fresh Aussie salmon, filleted to order, for $16 a kilo! 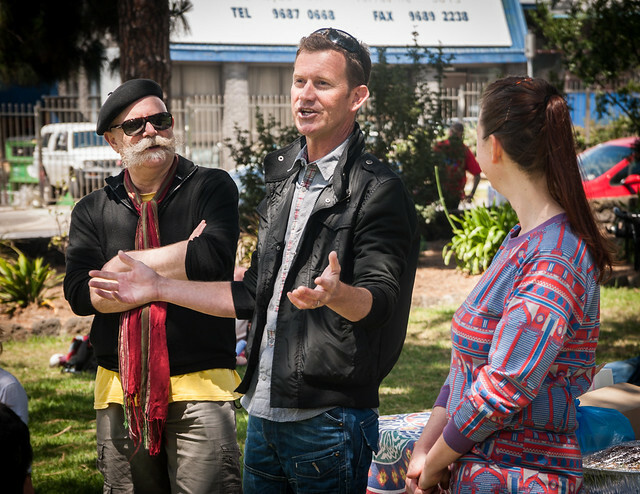 The Footscray Fresh Food Ramble was scheduled to coincide with Footscray Community Arts Centre's 'Spectres of Evaluation' conference, and after a period of being open only to conference attendees, is now being opened up for public bookings. The tour goes for a minimum of one hour, includes drinks and generous samples, and costs $40 (plus 30-cent booking fee). 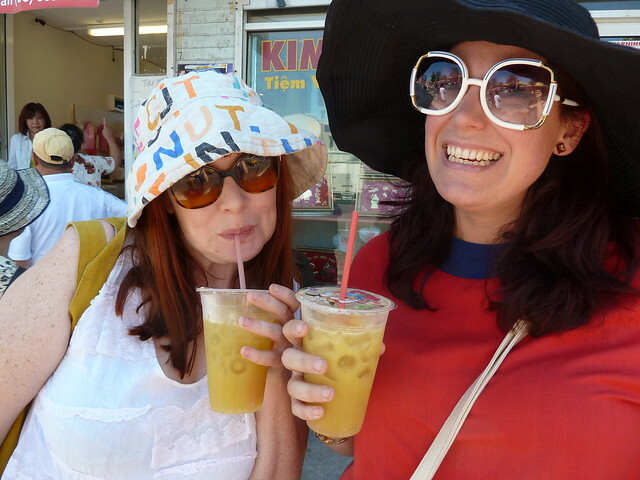 It is limited to 10 people, making it a lovely smaller group, and includes drinks and generous samples. Babes in arms are welcome on this tour, the only restriction being they must be in a carrier (eg, Baby Bjorn or Ergo) versus a pram. 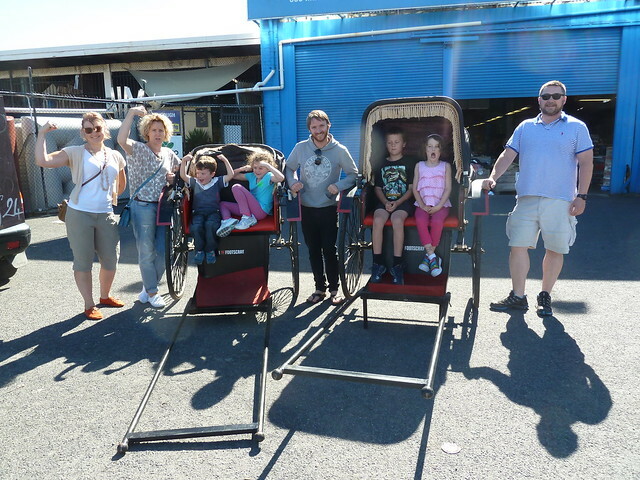 Of course it's fine to have a pram in the market normally, but it's just a bit tricky if there's a flotilla of ten at once! 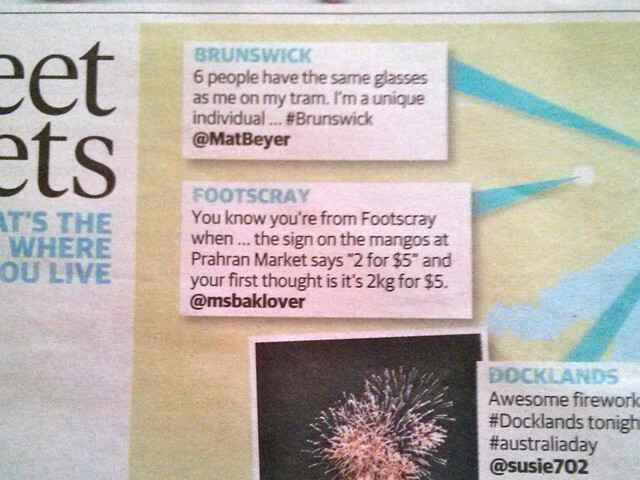 Browsing Prahran Market last week, I was struck by how good we've got it in the west - and the Sun chose to publish my tweet in this weekend's paper! Our markets really are the heartbeat of the 'scray. Let me show you around - book right here!